Stop by the CUESA Classroom for a cooking demo featuring the seasonal bounty of the Ferry Plaza Farmers Market. This demo will highlight a farmer-chef relationship forged and sustained at the farmers market, featuring Tomales Farmstead Creamery. 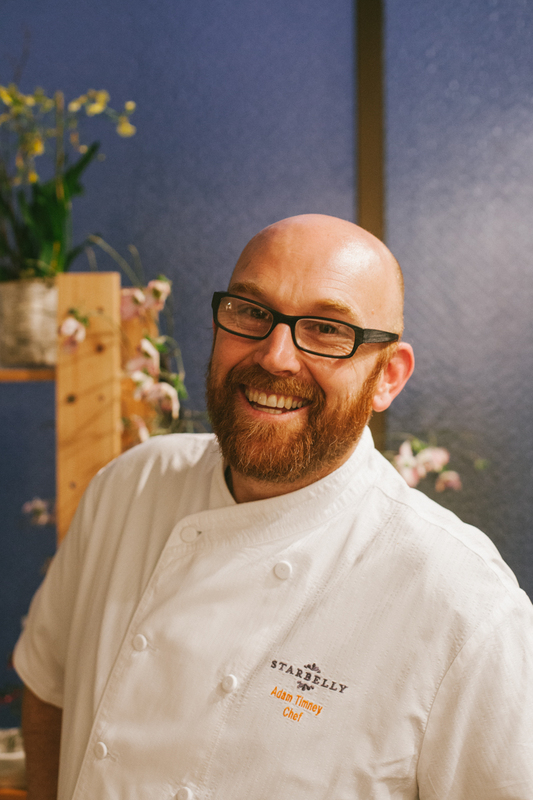 Fluent in a broad range of culinary styles and food cultures, Long Beach, Calif. native and Starbelly Executive Chef & Partner Adam Timney knew from an early age that the one thing that kept him feeling grounded was the passion he should pursue: cooking. Following his inclination, he traveled north and enrolled in San Francisco’s California Culinary Academy to learn the techniques of his chosen trade. Since his graduation, Timney has worked in such San Francisco favorites (and past favorites) as EOS, Chez Papa, Bacar, and Boccalone Salumeria, where he developed the knowledge he puts to work in creating house-cured Starbelly salumi. Beyond salumi, Timney’s high regard for meat presents itself in other delicious ways; the restaurant’s summer patio picnic series of family-style suppers includes main courses like honey-glazed ribs, Santa Maria Tri-Tip, fried chicken, and a whole-roasted hog. On board as Starbelly’s executive chef since its August 2009 opening, Timney offers unfussy yet thoughtful California comfort food that appeals to tastebuds of all types, served in a comfortable, relaxed neighborhood environment. Longtime lovers of the West Marin landscape, David Jablons and Tamara Hicks were so inspired by the region’s agricultural history that in 2003 they purchased 160 acres of rolling pasture a few miles from Tomales Bay and dubbed them Toluma Farms. With capital from the Marin Agricultural Land Trust (MALT) and a USDA rural development grant, the couple embarked on several years of intensive land restoration. Tomales Farmstead Creamery was born in 2012. Today, the family raises several animal breeds recognized for their high-quality milk, including Alpine, La Mancha, Nubian, Oberhasli, Saanen, and Toggenburg dairy goats and East Friesian sheep. The creamery’s cheeses bear Coast Miwok names in honor of the land’s first human inhabitants; for example, Atika, meaning “two,” is an award-winning aged goat and sheep’s milk cheese. All demos take place in the CUESA Classroom (under the white tents in front of the Ferry Building) and are free to the public, with recipes and samples for all.